We love a “lambwich,” a.k.a. a lamb sandwich. Keep the lamb rare! Photo courtesy of Meat And Livestock Australia. What—you haven’t had a delicious, grilled lamb sandwich yet? If your red meat sandwich experience has been limited to beef, you’re missing out. We love lambwiches! This is Part II in a series of four spring lamb recipes. Use the index below to click back and forth among them. This recipe uses lamb eyes of loin. 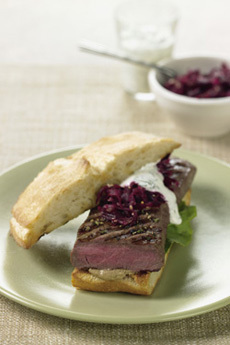 Top with the beet relish and yogurt and enjoy with iced tea or a glass of Pinot Noir. If you don’t like beets, you can substitute a savory chutney. Prep and cook time is 35 minutes. First prepare the beet relish, toasting the sesame seeds in a small pan, shaking until seeds are golden and brown. Add the remaining ingredients and cook on medium to low heat for 3-4 minutes or until beets are softened and the liquid is nearly evaporated. Transfer to bowl, cover and chill. To prepare the dill yogurt, combine the ingredients and refrigerate. This and the beet relish can be made a day ahead. Prepare the lamb: Remove the sinew and season the lamb with salt, pepper and oregano. Preheat grill or barbecue. Brush the lamb with olive oil. Grill for 2-3 minutes on each side, or until springy to the touch. Transfer to a plate, cover with foil and rest 5 minutes. Butter and grill the halved panini rolls and spread with mustard. Top with the lettuce, then lamb, either whole or thickly sliced. Serves 4. Recipes © copyright Meat And Livestock Australia. Additional material Lifestyle Direct, Inc. All rights reserved. Photos are copyright of their respective owners.